A binocular consists of two optical systems that are joined by a hinge and (typically) share a common focusing mechanism. The ability to create an image for both eyes simultaneously provides a realistic perception of depth. 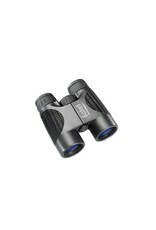 Binoculars are available in a great variety of sizes, magnifying powers and features to suit any purpose or preference. In porro prism binoculars, the objective or front lens is offset from the eyepiece. Porro prism binoculars provide greater depth perception and generally offer a wider field of view. In roof prism binoculars, the prisms overlap closely, allowing the objective lenses to line up directly with the eyepiece. The result is a slim, streamlined shape in which the lenses and prisms are in a straight line. Roof-prism binoculars are less bulky and more rugged than an equivalent porro model. Coatings on lens surfaces reduce light loss and glare due to reflection for a brighter, higher-contrast image with reduced eye strain. Bushnell riflescopes are coated with a microscopic film of magnesium fluoride. More coatings lead to better light transmission. Fully Coated: A single layer on all air-to-glass surfaces. Multi-Coated: Multiple layers on all lens surfaces. Fully Multi-Coated: Multiple layers on all air-to-glass surfaces. The size of the column of light that leaves the eyepiece of a scope. The larger the exit pupil, the brighter the image. To determine the size, divide the objective lens diameter by the power (a 4x 32 model has an exit pupil of 8mm). The distance a scope can be held away from the eye and still present the full field of view. Bushnell riflescopes provide an extra margin of comfort and recoil safety with extended eye relief and soft neoprene eyepiece guards. The side-to-side measurement of the circular viewing field or subject area. It is defined by the width in feet or meters of the area visible at 100 yards or meters. A wide field of view makes it easier to spot game and track moving targets. Generally, the higher the magnification, the narrower the field of view. For optimum image quality, it is important that the optical system of a riflescope delivers as much light as possible to the eye of the shooter. The lighter or brighter the image, the sharper the resolution and the clearer the shot. The quality of the glass, lens design and optical coatings all contribute to a riflescope’s ability to manage light effectively.When selecting your scope, consider magnification, objective lens size, exit pupil, resolution, field of view and eye relief. This permanent, patented, hydrophobic and oleophobic lens coating prevents fogging by causing condensation from rain, sleet, snow or even your own breath to bead up into much smaller droplets than on standard coatings. Smaller droplets scatter less light, which results in a clearer, brighter view.Now the hunter won’t miss the shot of a lifetime because of rain or accidentally breathing on his eyepiece. Resolution, or definition, is the ability of a scope to distinguish fine detail and retain clarity. Bushnell riflescopes use a high-durability aluminum alloy. They are also anodize-finished and are sealed to protect the inside from the elements. Each riflescope is rustproof, virtually scratchproof and a beautiful complement to the most expensive firearm. Bushnell riflescopes remain crystal clear in all types of weather. All 1” and 30mm diameter riflescopes are not only nitrogen purged to remove any vestige of internal moisture, but they are also O-ring sealed to prevent the entry of dust or moisture.